First and foremost, be careful—and cautious—on social media. Boasting about your new life—salary, trips, etc.—can only negatively affect your proposed settlement. Social security benefits for you and your ex, including current and expected future earnings. These documents are not only essential to the current divorce settlement process, but they help you and your attorney figure out what makes sense in terms of negotiations. For example, alimony negotiations might be affected by spousal survivor benefits from Social Security in 25 years. The more information you have now, the better you will be able to predict current and future tax consequences, and all of that affects what you demand and give up in the now. For example, a Roth IRA is worth more than a traditional IRA because it is untaxed in retirement. In a nutshell, one of the biggest mistakes you can make is being in the dark when it comes to your finances. Closing joint accounts is another very important task you want to take care of. Regardless of what your ex promises, you are responsible for any and all joint debts, and you are liable so long as your name—and their name—is on any account. Not only should joint accounts be closed, but authorized users adjusted for each credit card, and any agreed-upon debts assigned to the individual who plans to pay them. 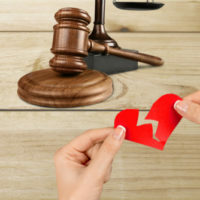 When it comes to making wise decisions during your divorce, you want to work with the very best divorce attorney you can find—someone who has a lot of experience practicing divorce law locally, and predict every surprise and consequence that might come along so that you are protected every step of the way. Contact our Florida divorce attorneys at HD Law Partners today and find out more about our skilled legal services.